Start with the style of radio dramas from a bygone era, add action-packed stories, intriguing mysteries, lessons in faith and Christian values. The result? 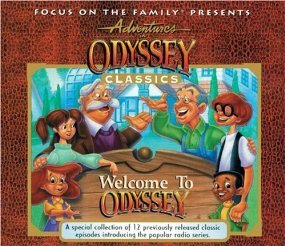 Focus on the Family's hit children's series, "Adventures in Odyssey"! This collection of previously released episodes will introduce new listeners to the characters and the early days of the entire series. You'll meet: John Avery Whittaker, Eugene Meltsner, Connie Kendall, Tom Riley.